Canada’s second largest carrier WestJet is adopting the strategy of many low-cost carriers worldwide through the creation of a hybrid model to bolster its share of the lucrative travel market. While in the short-term all the carrier’s efforts are focused on the launch of its new regional carrier Encore in 2H2013, WestJet is examining several options beyond its five year plan, including the possible deployment of widebody aircraft. If WestJet opts to seriously consider deploying aircraft into long-haul markets beyond its current transborder offerings, the carrier will unleash competition against rival Air Canada in one of its last protected business segments. WestJet joins many low-cost carriers including its North American counterpart JetBlue that are transforming their business models from a pure low-cost structure to a hybrid model in order to expand their passenger base to capture lucrative corporate travellers. WestJet set a course to transition its business model from the simple low-cost formula several years ago as it began to forge codeshare and interline relationships, changed its loyalty programme to make it attractive to business customers and added markets to its network that are more attractive to corporate clients. The carrier now has more than 30 interline and codeshare partners, and recently stated it would achieve its goal of generating CAD100 million (USD101 million) in revenue from those partnerships a year early in 2013. During 2011 WestJet intensified competition in Canada’s eastern triangle (Toronto, Montreal and Ottawa) by increasing frequencies in those key business markets and during 2012 the airline added the attractive US transborder markets of Chicago O’Hare and New York LaGuardia. The nimbleness with which WestJet has been able to transform its business model is underpinned by its strong financial performance. 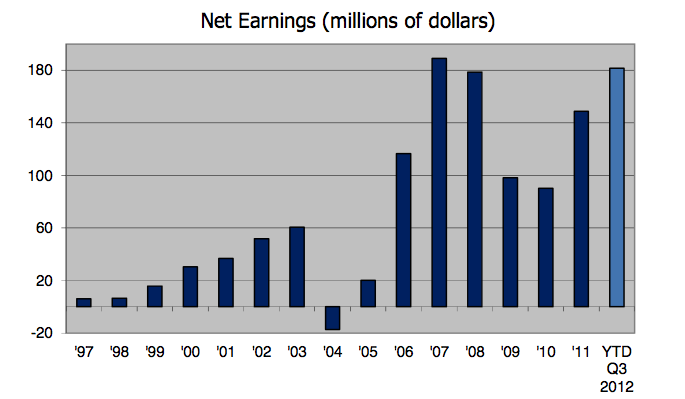 During a recent discussion with investors WestJet management remarked that 1Q2012 and 2Q2012 were record quarters for the company in terms of profitability. 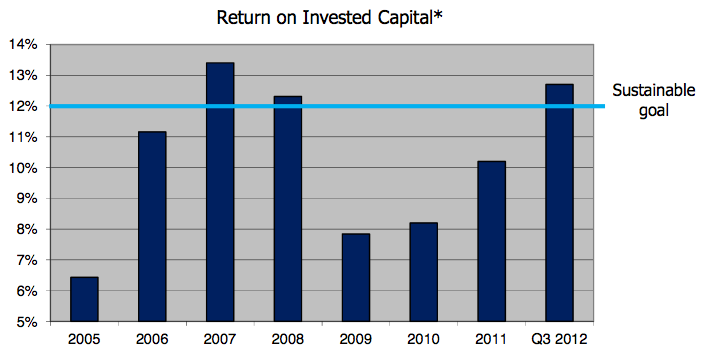 Through the 9M ending in Sep-2012, WestJet recorded CAD180 million (USD181 million) in profits and hit its targeted return on invested capital of 12%, which was a rebound from its lacklustre ROIC performance from 2009 to 2011. Carrier CEO Gregg Saretsky noted the challenge now is for WestJet to maintain its return momentum and “not become a one quarter wonder”. WestJet’s latest turn at building a hybrid business model is the creation of three fare bundles the carrier plans to introduce in conjunction with its premium economy seating product shortly after 1Q2013. The bundles – Econo, Flex and Plus – are designed to appeal to the budget conscious leisure traveller and the corporate customer requiring a higher degree of flexibility in travel that accompanies a higher fare. WestJet executives did not state that a premium economy seat would be featured in the top tier Plus product bundle, but the aim of introducing an extended legroom offering was to increase the carrier's corporate traffic. WestJet is actually adopting a strategy introduced by its main competitor Air Canada in the mid-2000s when it debuted its various fare bundles. Air Canada has responded to WestJet’s plans to offer fare packages by renaming its Tango Plus grouping Flex ahead of WestJet’s bundled product debut. Air Canada’s Flex product is a step up from the basic Tango product, offering advanced seat selection and 100% loyalty mile accrual. While WestJet’s basic bundled fare option aims to target budget conscious travellers and customers who would otherwise travel by automobile, its major aim of introducing fare classes appears to be offering a more appealing product to corporate customers. Mr Saretsky stated WestJet currently only has roughly 10% of the managed corporate share in Canada, which represents a “huge opportunity with the right product to better penetrate that segment of the market” that has disproportionately high yields. WestJet’s rival Air Canada has enjoyed robust premium unit revenue growth during the last few years, including 4.2% growth year-over-year for the 9M ending Sep-2012. 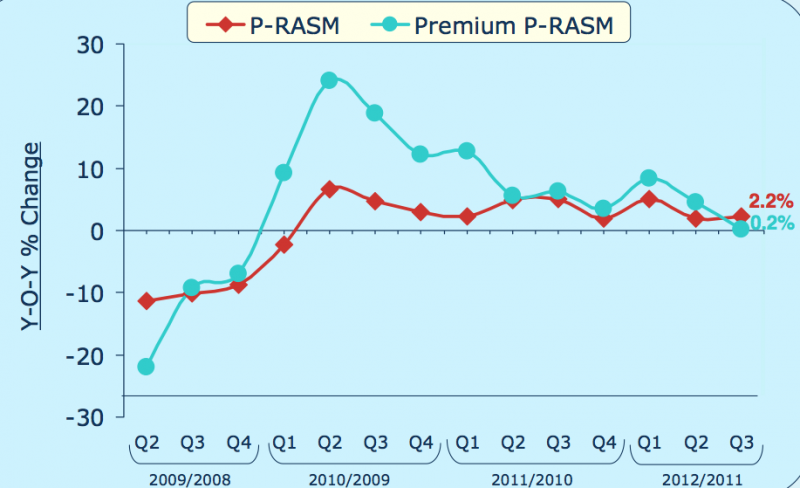 But its year-over-year premium unit revenue growth has tapered off significantly since it peaked in 2010, jumping more than 20% year-over-year during 1Q2010. Executives at WestJet estimate the fare bundles should generate CAD50 to CAD80 million (USD51 million to USD81 million) in additional annual revenue. During the spool-up period in 2013, the product bundling should fetch WestJet CAD30 million to CAD50 million (USD31 million to USD51 million). WestJet believes it has the capability to essentially double its ancillary revenue per passenger from CAD7.86 (USD7.92) per passenger to CAD14 to CAD15 (USD41.2 to USD7) per guest in the 2016-2018 time period. Carrier EVP sales, marketing and guest experience Bob Cummings said the “big hitters” to increase per-passenger ancillary revenue are charging for the first checked bag and use of call centres. The carrier should prepare for some passenger backlash if it does introduce a first bag fee as those charges are unpopular among budget travellers. There are also other levers WestJet will pull to bolster its ancillary revenue as it works to add technology to allow for more merchandising and retailing. WestJet’s major focus during 2013 is the launch of its hyped new regional carrier Encore, which will debut in 2H2013 with 78-seat Bombardier Q400 turboprops. But the carrier is studying the evolution of its business to long-haul operations with widebody aircraft. Mr Saretsky said WestJet is just starting to explore the possibility of a widebody operation, and has held discussions with both Boeing and Airbus about aircraft capabilities, availability and price. He admitted the manufacturers do not have open delivery positions for their flagship 787 and A350 widebodies until 2019, but lessors do have delivery slots available before that timeframe. WestJet’s chief expressed no concrete plans exist to deploy widebodies, but stressed that given how fast the industry moves, WestJet is engaging with the airframers early “just to be ready”. He also said Encore would need to be well-established in order for WestJet to consider long-haul aircraft given the regional carrier would feed passengers into markets where the larger jets would be deployed. WestJet serves all the major international gateways in Canada including Montreal, Toronto and Vancouver. A potential push by WestJet into long-haul markets would result in the carrier competing with Air Canada in all sectors – short, medium and long-haul. Air Canada’s long-haul operations have remained shielded from competitive pressure by WestJet, and any foray by WestJet into Air Canada’s long-haul markets will erode revenue premiums Canada’s major carrier has enjoyed for decades. WestJet has no doubt carefully looked at Air Canada’s performance on long-haul Asian routes, which produced 13% yield growth year-over-year in 3Q2012. WestJet is likely considering long-haul operations for the same reasons that it opted to create a regional subsidiary to expand into short-haul flying: the carrier needs to find new avenues for growth beyond its traditional Boeing 737 narrowbody services. “We must evolve our model or die,” said Mr Saretsky. WestJet’s chief also concludes the carrier needs to widen the cost advantage it enjoys over its main rival. Mr Saretsky stated the 30% cost advantage WestJet has historically enjoyed over Air Canada has been cut in half. “We need to widen that gap,” he concluded. The example of Australia's LCC Virgin Blue (now full-service Virgin Australia) will be front of mind, as that carrier stuttered while it hybridised in search of corporate accounts and higher yields, unable to prevent costs rising faster than expected. Fortunately for WestJet, Air Canada's unions will not permit the flag carrier to establish a low-cost subsidiary like Qantas' Jetstar, so the Canadian LCC is not so vulnerable to low end competition. But the path to higher yields is typically fraught with risks, most notably cost creep. During 2012 WestJet battled its own cost issues as it estimated unit costs excluding fuel for the year would rise 3% to 3.5%. The carrier defended the rise, noting it was making investments in aircraft and merchandising technology that would produce favourable margin expansion in the long term. The carrier predicts a smaller increase of 2%-3% in its unit cost during 2013. WestJet’s financial performance during the last few years has allowed the carrier to intensify competition with Air Canada, which has suffered mounting losses during that time, accompanied by sour employee relations. WestJet has many advantages over its main rival as it continues its evolution into a hybrid carrier. But as it moves into uncharted commercial territory, the now-hybrid LCC must carefully manage its business model evolution to ensure the transformation does not undermine its cost advantage.